At Five9’s first analyst summit since Rowan Trollope became CEO, a group of industry analysts had the opportunity to spend a day and a half with the company in beautiful Yountville, CA, the heart of wine country. We heard about the company’s strategy and direction and got to meet the new management team, including the new CMO, CTO and Head of AI, EVP Engineering, and EVP Strategy & Operations. Trollope kicked off the event by stating “The contact center will change more in the next 5 years than in the last 25 years combined,” adding that moving to the cloud is just the first step. The cloud is key because, as Trollope noted, “The cloud leads to data at scale, and data at scale is leading to AI and that’s where the magic happens.” As the contact center shifts from being labor intensive to software defined, it “involves people + workflow + data + AI.” Using live agents will become more important in the contact center of the future, as machines “can’t even fake empathy,” and it’s therefore important to augment what humans do so well. Providing an update on Five9’s progress, Trollope noted that in 2018 the company had invested heavily and added world-class R&D leaders, launched its Genius AI enablement layer, increased delivery agility (three releases in 2018), and invested in strategic CRM partnerships, notably with Salesforce. Five9 also improved all metrics of service delivery, including uptime, CSAT, customer effort, and NPS scores. According to CFO Barry Zwarenstein, the company is on firm financial foundation, with a $3B market cap and 24 consecutive quarters of gross margin expansion. The financial numbers were impressive. Dan Burkland, President of Five9, answered the question, “Why do customers choose Five9?” He pointed to the Five9 TRUST Platform with 99.993% system availability uptime, as well as the company’s cloud innovation. Five9 noted that, while other vendors promise high uptimes in their SLAs, and then fail to deliver them, Five9 has consistently delivered uptime in excess of their promised SLA. Five9 is now delivering 4 9s SLA on every contract. Burkland also noted that Five9 can provide an end-to-end offer by partnering with UCaaS vendors such as TetraVX for customers that want a packaged solution. Five9’s high-touch approach throughout the entire customer life cycle is a point of pride for the company and was touted several times during the conference. Andy Dignan, SVP Senior Professional Services, and Ted Jordan, VP Customer Support, gave a great presentation about Five9’s professional services, highlighting the company’s 190+ professional services team, claiming that Five9 has the largest cloud contact center professional services team in the world. Dignan and Jordan work together to ensure end-to-end service delivery, as Dignan’s professional services team offers implementation and advisory services, followed by Jordan’s customer success team, which focuses on the customer experience after the deployment and production stage. During the event I spoke with Jim Nystrom, EVP Sales, about Five9’s high-touch service and support and the Five9 TRUST platform, as well as the company’s move upmarket to larger organizations. CTO & Head of AI, Jonathan Rosenberg, who I often refer to as “the smartest person in the room,” along with Jim Hickey, VP Product Management; Scott Welch, EVP Cloud Operations; David Pickering, EVP Engineering; and Brian Schnack, Director of Product Management, provided a product update and a look into the company’s roadmap. Acknowledging that “the CRM vendors won the desktop,” Hickey and others discussed the joint efforts with Salesforce to provide native integration, as well as integration with Einstein for bot and analytics capabilities. Five9 claims to be the first CCaaS provider to natively integrate with Salesforce, offering the most comprehensive integration feature set with Salesforce. As part of its open platform approach, new SDKs were introduced, including SDKs for UC integration, IVR/IVA integration, CRM integration, and a text channel API. Microservices and the public cloud, or Platform as a Service (PaaS) is the new “must have” discussion at every analyst event, and Five9 described its use of the modern SaaS for improved reliability, flexibility, and speed. 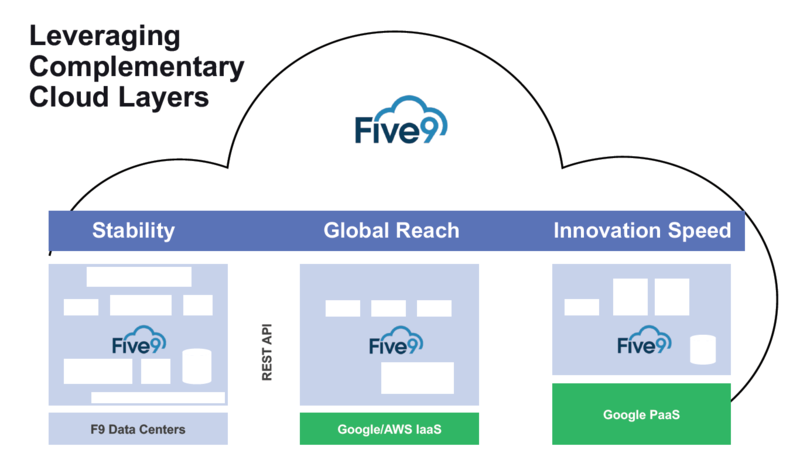 I spoke with Jim Hickey, VP Product Management, who provided an overview of the Five9 product line, as well as an overview of Five9 Genius, the AI enablement layer that was released in Spring 2018. 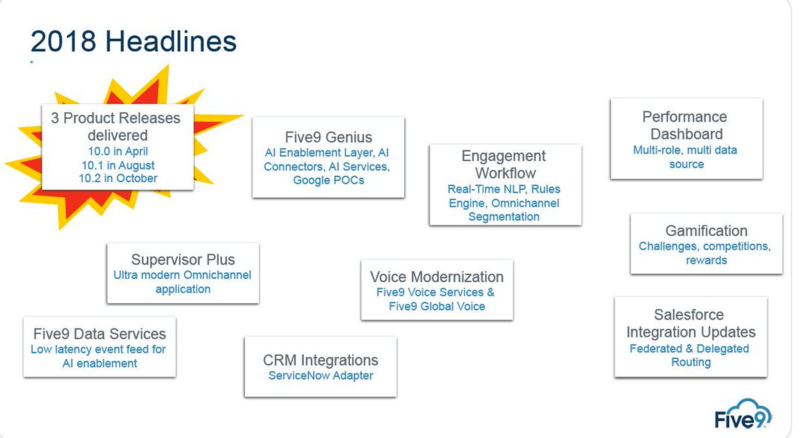 In his mostly NDA presentation about Five9’s path to AI, Rosenberg claimed that humans will play an important role in customer engagement for the foreseeable future, noting “Humans bring the heart, and the machines bring the mastery.” With its “Intelligent Cloud Contact Center,” Five9 hopes to lead the way in “making every customer’s connection to the contact center like the best one they’ve ever made.” This requires having the right data, which lives throughout the organization and needs to be brought together with the right integrations. Rosenberg stated that what’s important when it comes to data is what you do with it, referred to as the workflow. Five9’s Genius is at the center of what the Rosenberg referred to as the software-defined contact center. Genius is “all about data, integrations, and workflow – knowing what data to get, where to get it, and what to do with it.” Unfortunately, much of what Five9 is doing in the world of AI is NDA, but suffice it to say that most (if not all) of the analysts were very impressed with the company’s vision and practical use cases, providing more specifics than we’ve seen from any other vendor to date. In this video interview, Rosenberg discusses Five9’s AI initiatives, the real value of AI, and why Five9 is well positioned to be a leader in this area. I spoke with new CMO Ryan Kam about the key messages from the analyst event, where he emphasized the company’s customer-first culture. We also discussed his goals for Five9, and what enterprise customers should be thinking about when it comes to customer engagement and Five9’s role. Five9 has been doing a great job of expanding its reach as it serves increasingly larger customers, and is proud of its financial success. With an energized management team, a strong focus on using AI to provide real value to customers and agents, solid financials, a large ecosystem of powerful partners for CRM, WFO/WEM, as well as system integrators, VARs, and Master Agents, Five9 is in a good position to continue its success as a leading CCaaS player. The company is trying to move upmarket to larger enterprise deals, while also expanding internationally, which is always a challenge. Competing with a growing list of CCaaS competitors, coming from all directions, Five9 will have to continue its pace of innovation while leveraging the efficiencies of public cloud providers. I hope to be able to share what Five9 has been up to in the AI arena in the near future – it looks pretty darn awesome.